The PowerShot ELPH 510 HS continues the Digital ELPH tradition of bringing you powerful features and ease of use in a stylish and compact metal shell. Read more in our Full Conclusion. Canon continues to add new and exciting models to their popular PowerShot ELPH HS line, and the ELPH 510 HS is no exception. This model replaces the ELPH 500 HS we reviewed earlier this year, with some much appreciated upgrades. The most notable of these is the impressive 12x optical zoom lens with Canon's legendary Optical IS (Image Stabilization) system. This unit covers a vast zoom range of 28-336mm (in 35mm equivalence), which is the longest range ever offered on an ELPH model (as of 8/2011). The 510 carries over the powerful 12-megapixel 1/2.3-inch CMOS image sensor and DIGIC 4 processor from its predecessor, along with the same 3.2-inch touch screen LCD. With an enhanced Smart Auto exposure mode, Canon's HS (High Sensitivity) system, Intelligent IS, and full 1080p HD video recording, the ELPH 510 HS is chock-full of awesomeness. 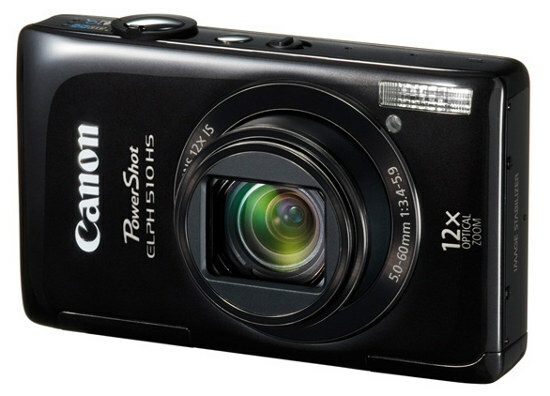 The PowerShot ELPH 510 HS is available now for about $349.99 USD. Check our buy box below for the most current online pricing from various retailers.